National Signing Day stands just a little over a week away, and the energy level from Gator fans is reaching a fever pitch. After losing two earlier this month, it’s starting to look like a third Gator commitment is starting to slip away. How does the wavering of Marsalis Teague factor into the equation for the Florida recruiting class of 2009? There were reports by some outlets that Robinson had dropped Florida based on some comments by former Deerfield Beach head coach Art Taylor (he was let go by the school last week because of “philosophical differences”), but I do not believe that to be the case. So, it becomes a natural question…is Denard feigning a lack of interest in Florida to help leverage offers for his teammate Adrian Witty? Witty is a good football player in his own right, but missed considerable time this past season due to a knee injury he suffered in the 2007 Class 6A state finals against Miami Northwestern. He isn’t a Florida-level talent, but Michigan thinks highly enough of him to make an offer, as did Kansas State and a host of other schools. Clearly, he has some ability to be regarded as a BCS-level recruit by so many programs. However, Robinson is clearly the prize at Deerfield Beach. He is a game changer who will be a big-time player (although maybe not at the QB position) on the next level. 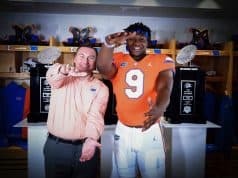 While Florida is still in play here, I feel like it is more likely that Robinson will end up at Kansas State or Michigan on National Signing Day. 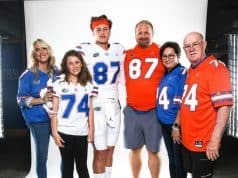 As for the quarterback who Florida will get in this class, Jordan Reed took his visit to Gainesville this weekend and had an enjoyable experience. 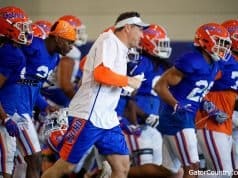 He seems to be getting along very well with new quarterbacks coach Scott Loeffler, and there are no concerns whatsoever about his level of commitment to the Gators. Read the rest (over several pages long) over on our exclusive, members only Insider Recruiting forum! Not a member? Join Gator Country today and get the REAL inside scoop!